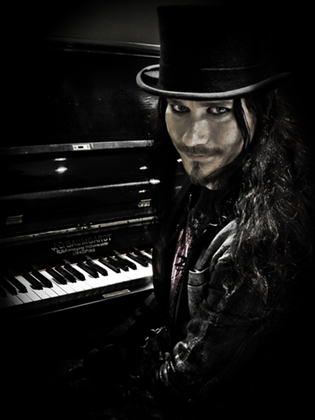 On Friday 14th of October I got the opportunity to meet Tuomas Holopainen from Nightwish at Warner Music in Stockholm for an interview. Their album, Imaginaerum, is scheduled to be released on December 2, 2011. You are now preparing for the album release and the tour, what are your expectations for the upcoming tour? It was two years ago since the last time and we are all excited. When I looked at the tour plan I noticed that there is going to be some really big shows this tour. In Milano we are going to have an audience of around 11000 and in Paris around 13000. Where did you get the inspiration for the new album Imaginaerum? Our previous album, Dark Passion Play, was very gloomy and heavy so I thought this album should be more easygoing. I got some of the inspirationfrom people like Tim Burton. This album is kind of a tribute to the fantasy world. What kind of music is on the album? Are the patterns of the songs more like 'Bye Bye Beautiful', or more epic like 'The Poet And The Pendulum'? The music is considerably more weird and incoherent. You mentioned sometime that there could have been more choirs on the DPP album. What are the choirs like on Imaginaerum? It is a bigger choir now than before. On the DPP album there was only 24, now there is 32 people in the choir. Besides that we have doubled the choirs track on the recording so that we can make it sound like they are 64. We have also recorded three tracks with the keyboard to back up the choir. We wanted it to sound a bit like Hans Zimmer. Does anyone else than Anette and Marco who sings on the album. Do you have any guest artists? Troy sings in the C part of a song. When you produce the music, do you finish the parts for the bass, drums and guitars as well? No I don’t, I try to add as much as I can and then everyone gets a demo to listen to. This should give them a picture and an idea so they can come up with their own interpretations. Who had the most difficulties getting the songs together? I don’t know; no one really. Probably me because I had to record on the go, come up with new things and try to make it right. I spent the most time recording. How did you spend so much money producing the latest album, over half a million €? Think for yourself, we were 9 months in the studio; there were 53 persons in the orchestra and 32 in the choir that had to get their salary and so on. Was it difficult to record the children choir? It went quite smoothly. The leader of the choir had the children under control and they had rehearsed for weeks. Many Finnish bands choose to sing in Finnish, how come you write your lyrics in English? It feels more natural and familiar for me. I have written 4 or 5 songs in Finnish and have not been satisfied with the lyrics at all. English is more grateful to work with. How do you think your fans will react on the movie? I think they will be a bit chocked, in a good way. The best memory from Canada? See the actors in action and to feel their sincerity. One of the starring actors came up to me, Francis X. McCarthy; he is now 72 years old. He told me that he really appreciated to work with us and that for me was big. I can’t say which song is the best because the whole album is more like one long song, more like a theme. What do you do 5 minutes before getting on stage? I want to be by myself. Go through the set list and the sounds. Find the right feeling. It's kind of a meditation. Give examples of your sick sense of humor? Tuomas tries to figure something out and suddenly he says ‘We have Black humor like Bill Cosby' – we enjoy making fun of people, but you also have to know when to keep your mouth shut. How would you change the band if you could? We're far from perfect, I know. But I think that's what makes us who we are as a band. Have you ever experienced something unnatural? All kinds of things, when I was younger we tried to talk to the dead by Spiritism. But I'm skeptic. I have hard to believe and hard not to believe. Tell me about some Fan-meeting? Well, there've been all kinds of them. Even those who have came to my front door. But one thing I'd like to tell you about is this 9 year old girl I met in Montreal, Anna Key. I play her dad in the movie and there's a part where she sits on my knee by the piano and we play along. She became our fan meanwhile we were recording in Montreal. Every morning when she saw us she was exited and waved at us and yelled hi and smiled! The last recording day was ending and I went to say goodbye to this little girl. I told her nicely that we’re leaving. She started to cry and it was so sad to see. I don’t really know what happened to me, the feelings where overwhelming and it ended up we both shed a tear saying goodbye to each other. "The world is full of truths that shouldn’t be said out loud"
- my grandpa told me this and it’s a really good quote. Some advice for those who dream about becoming a famous musician. You should not dream of the success in it, you need to love music truly and deeply. At first you have to understand the wonder of music. For second you need to find the right band members, and for last you start producing the songs. Most romantic thing you want in a woman? When I was younger I was into Belle in Disney’s 'the beauty and the beast' I think she still is the one. My dark humor and my enormous nose. For others: That I avoid taking responsibility and that I dislike conflicts. Tuomas looks at his beer he's drinking and smiles while he tries to figure out an answer. - I try to work out, I love to hike! Although, I don’t get to do it so often. It's also important to find your own border, to know when you should go away and be for yourself and just be. How do you work under high pressure? Well, I have high tolerance. Is independence and decision-making in your work important to you? Independence yes. I need to be alone to make music; I need the time and the peace. About the decision-making - I've unwillingly ended up at the top of the "Nightwish-pyramid" and it's not always that pleasant. I like to be there when it comes to the music but when it comes to all the external things, I'd like to back off a bit. What is the best to be "Nightwish"? This is a self-created universe. This is home. This is where I can celebrate, mourn, feel sad or glad; this is a safe place where I can be me. The most beautiful place on Earth where you go to relax? Expectations of Gothenburg gig 10 / 4? This is the start of the European tour! Lisebergshallen have always been good to us. And now when we have Anette in the band it almost feels like home. I also got to meet Anette after my interview with Tuomas and I just had to ask her which Finnish word she’s learned “against her will” because the boys in the band use it so often. And as I guessed it was a curse. The word is: Vittu. I'm really looking forward to the release of the new album Imaginaerum. wau!great stuff! cant wait for the album or the show in sweden!